Received a comment about duplicate meta tags, the commenter was using the Avada WordPress Theme (I’m not familiar with it, think it’s a premium WordPress theme) and the Yoast SEO Plugin version 3.5. Easiest way to check for duplicate open graph meta tags and other meta tags is to load a selections of WordPress pages in a browser (FireFox, Google Chrome) and view the HTML source. The selection of WordPress pages should include: the WordPress Home Page, WordPress Post, WordPress Static Page, WordPress Category, WordPress Tag, any other types of WordPress output. You have to check them all because each type could have different results. I loaded the commenter’s home page http://motorhomescampervans.net in FireFox and Right Clicked on the webpage (not over an image) and selected “View Page Source”. This opens a new FireFox tab with the HTML source of the webpage: see screenshot of the relevant part of the HTML code below – I’ve highlighted the duplicate OG tags in blue. This is hidden meta data used by search engines and social networks like Facebook, Google+ and Twitter when your webpages are shared. If you find two or more copies of the same OG meta tags you have a duplicate Open Graph Meta Tags issue. With so many WordPress themes and plugins having social media network features it’s not difficult to have them added twice by mistake. 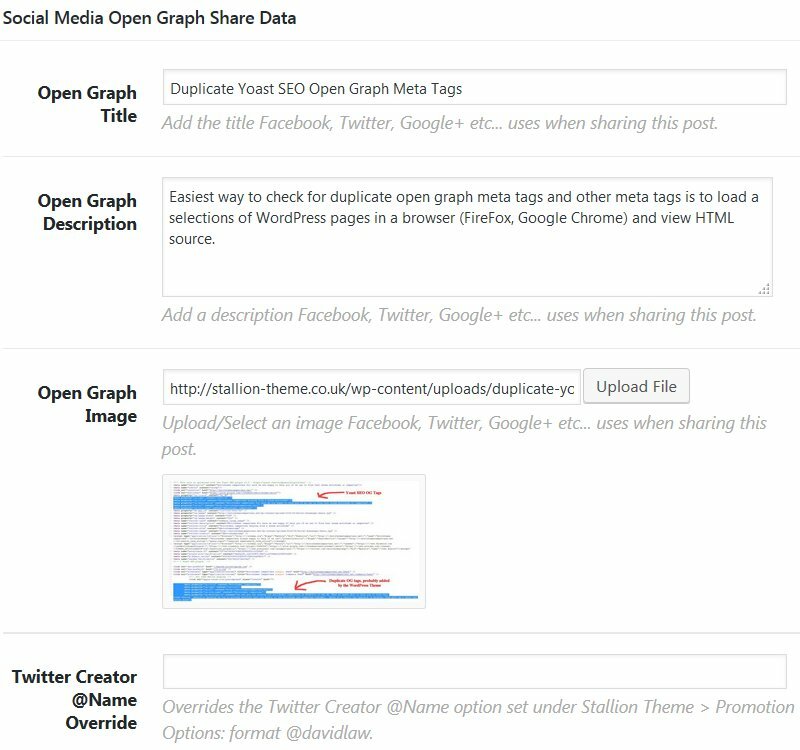 Since the commenter uses the Yoast SEO plugin to add a complete set of social media meta data, they should disable the Avada Open Graph meta tags (looks like a partial set of data) under the Avada Themes Options. To be fair, this isn’t a failing of either the Yoast SEO plugin or the Avada WordPress theme, it’s a case of the user not understanding the SEO plugin and the theme replicate the same feature. One needs to be disabled. In Stallion Responsive (the WordPress SEO theme I develop), there’s an option to add Open Graph meta tags, so could happen to my theme users. 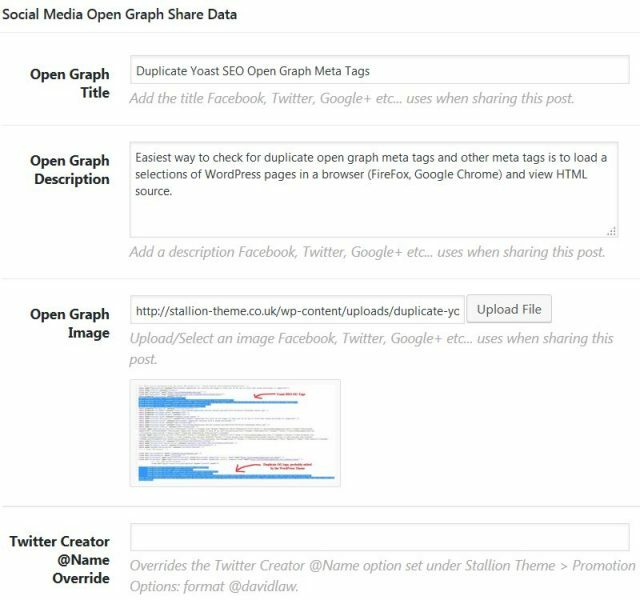 Below is a screenshot of Stallion Responsive’s open graph meta tags form for this WordPress Post – the form is where you set specific OG and Twitter meta tags for a Post or Page. I’ve used the same database names as Yoast does for Open Graph and Twitter Meta Tags, means if a person installs Stallion Responsive after (or still) using Yoast, Stallion can use the Yoast SEO data (Stallion uses most of Yoasts SEO data: also uses the All In One SEO plugins SEO data as well). 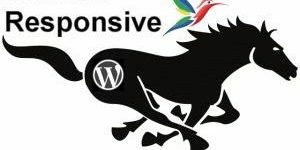 Think I’ll see if I can disable the Stallion Responsive output when Yoast is active, I don’t recommend using Yoast SEO (see my Yoast review), but lots of WordPress users use Yoast, so have to take user behavior into account. I currently have an option on the Stallion Responsive Promotion Options page to turn Stallion’s completely off, will have to add to the feature that if Yoast SEO is active and OG meta tags are on, don’t use the Stallion Responsive Open Graph/Twitter SEO data (we don’t want double Open Graph and Twitter meta tags). 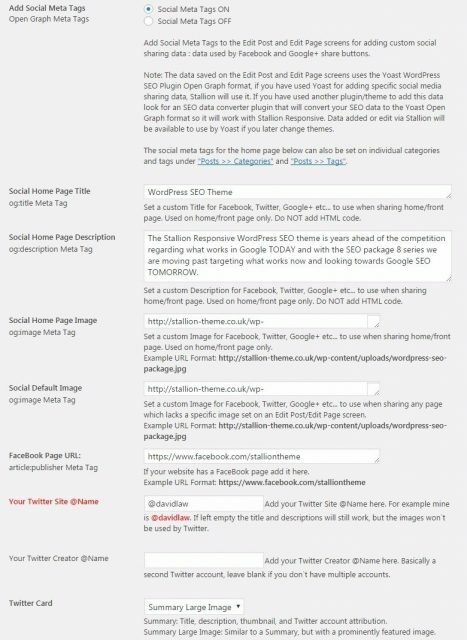 The screenshot shows this sites home page Open Graph and Twitter settings and sitewide settings. The Yoast SEO plugin does have what I consider (some would argue they aren’t duplicate) a duplicate social networks meta tags issue. The Yoast SEO plugin goes a little over the top on Open Graph type meta tags. If you view HTML source of this post you will see I have a smaller set of meta tags than Yoast SEO outputs: I have OG tags built into Stallion Responsive and have only added the ones that are NEEDED. Facebook uses the standard OG meta tags, so OG ones are all that’s needed for Facebook. Twitter uses most of the standard OG tags, but also has it’s own Twitter meta tags. Twitter has these unique Twitter meta tags that are required. If you know what you are doing in developing in WordPress these are the ones you should have available. In the Yoast WordPress SEO plugin these Twitter meta tags are overkill. Don’t know if Yoast has an option to disable the ‘duplicate’ Twitter meta tags. From a performance SEO issue it’s a tiny SEO negative. It’s extra database connections, extra data to download, but it is a tiny, tiny amount: one unoptimized image will do far more SEO damage. Add Tags to the Yoast XML Sitemap? 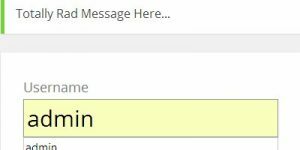 In the Yoast sitemap xml do I drop post tags from being in the site map now? So far I have taken all the tags from the posts as suggested now just for clarification should I delete the actual tags? I have been going through the comments idea and your plugin (I have an error on the Avada theme as the select comments on is set to yes and remain not showing) awaiting support question. I have also bulk edited the posts to comments on as well. Since you don’t want the tags indexed, there’s no reason to add them to your XML sitemap. My WordPress SEO Comments Plugin is a powerful SEO feature, I have a more advanced version as part of the Stallion Responsive theme. The SEO plugin version doesn’t have half the features the SEO theme version has. One missing important SEO features is unique Comment Titles (you’ve used the feature on this site when commenting). Stallion Responsive comment titles are really important for gaining traffic from Google directly to your comments. Note: after sending this I’m going to modify your last comments title for SEO reasons (I do this regularly to maximize the SEO benefit from user comments). You can see the SEO power of the concept of indexing comments with unique comment titles in their own right by using a Custom Google Search. Search “Delete Tags” and the first result is an old comment Whitehat SEO PR Sculpting : Delete WordPress Tags and…. At the top of the comment text is a link back to the main WordpPress SEO Tutorial article, that link will take you to the main article so you can read the entire discussion from the point of the “Whitehat SEO PR Sculpting” comment: it’s covers what you asked about. Without the Stallion Responsive SEO commenting feature, Google wouldn’t be able to link directly to specific comments. The SEO theme features adds a lot of extra SEO’d content to this site that pulls in additional traffic. I wouldn’t write half as many comments if they didn’t generate traffic. As discussed in the “Whitehat SEO PR Sculpting” comment thread my advice is try to limit how many archives you add a post to. I try to limit it to 2 or fewer (could be two categories, two tags or one of each). Sometimes more will make sense, but 2 is usually more than enough. Try to delete categories and tags that don’t serve a purpose and/or don’t generate traffic. Since I run Stallion Responsive I’d just delete the tags/categories and let the automated 301 redirect feature redirect the SEO benefit to the home page. Since you use another theme look at adding 301 redirects to your .htaccess file (discussed on the site). On the comment form missing in your theme, try editing a post and check they are turned on at the post level. If you start a WordPress site with commenting turned off and publish 100 posts say and turn commenting on, the 100 old posts will still have their comments turned off. Covered this issue in the comments with solutions to turn a lot of comments on quickly : use the Google custom search form to search for “Turn Comments On”.